AHOY!!!! 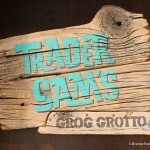 Trader Sam’s Grog Grotto is now in soft openings at Disney’s Polynesian Village Resort!!! And we are SO excited to share pictures from some of our awesome DFB Readers who were there to ring in the occasion! Many thanks to Lori Hope Fries, DFB Reader and co-founder of TheMainStreetMoms.com, for sending in some awesome pics for us to share with you, along with her review! We’re also suuuuuper grateful to our friend David Shearer for sharing his incredible photos as well! 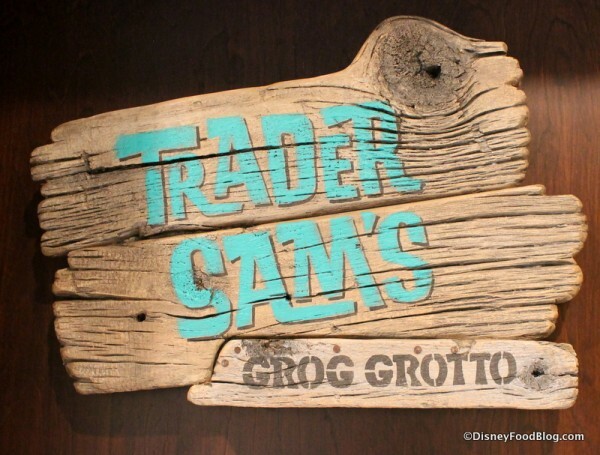 We’ll be using the collection of both of their pictures along with a few of ours to tell the story of the very first days of Trader Sam’s Grog Grotto. But before we go in… what is a “soft opening,” exactly? 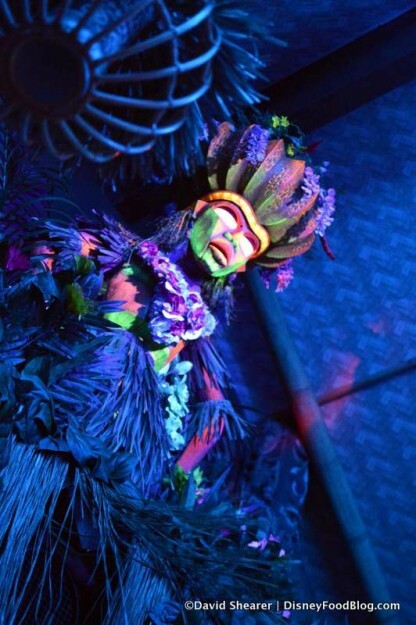 Basically, a soft open means that guests may find Trader Sam’s in operation during a visit to the Polynesian from now until it’s official opening (expected for late April), BUT it can be closed at any given time to continue any necessary work. So, fair warning. Umm, actually, let’s head inside the Grotto after we wait in line. Just getting in on the first day was no easy task! And so, a head’s up: for at least the first months of operation, we can all expect longs lines to be rule, not the exception. 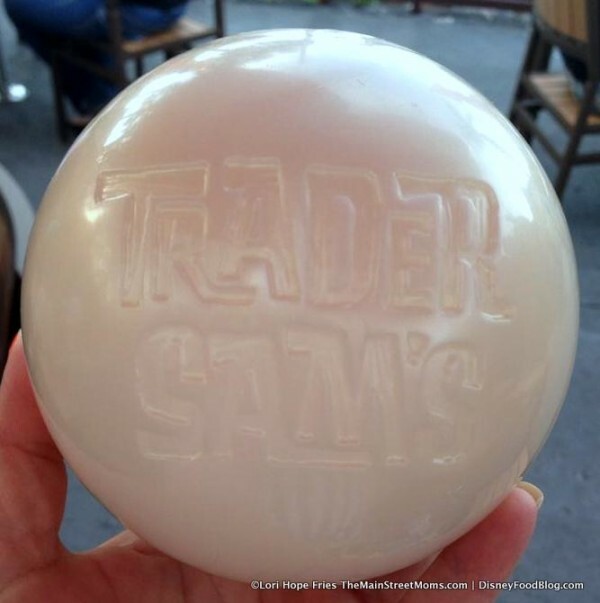 Anyone who’s had experience with Trader Sam’s in Disneyland will be fully aware of this gigantic problem. Okay, with that out of the way, NOW let’s step inside and see what treasures await! 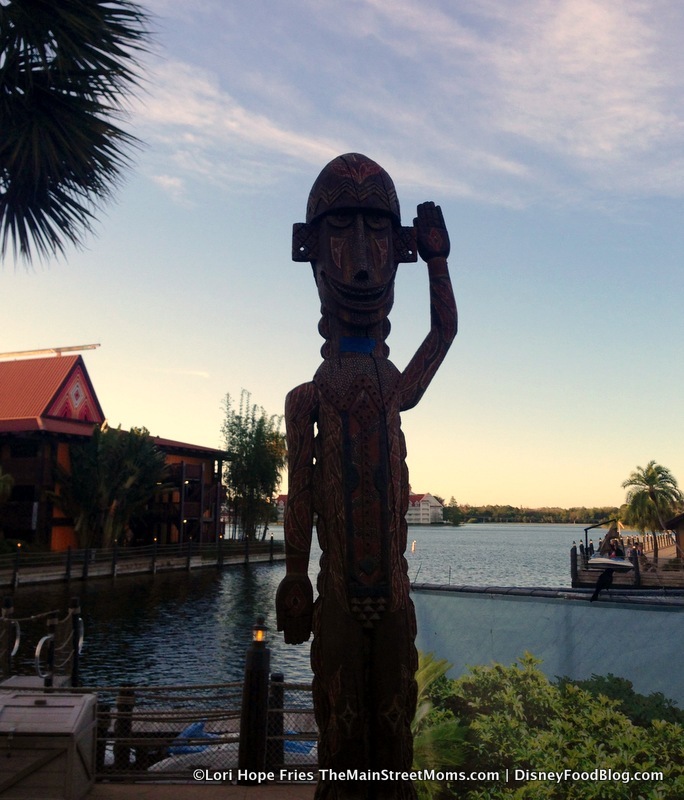 “We have been on watch for months, waiting for Trader Sam to land at the Polynesian Village Resort. Trader Sam’s Enchanted Tiki Room, at the Disneyland Resort, is a favorite stop when we go, and have been there many times. 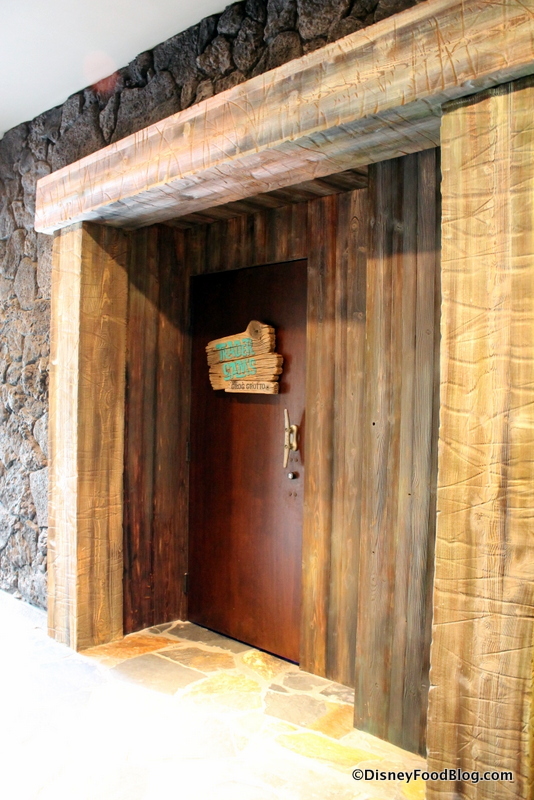 My middle son, Dennis, is an avid tiki mug collector, so we watched as the lobby walls came down around the fountain and a cast member showed us the door leading to Trader Sam’s new location. We watched and waited. When you go on the Jungle Cruise in each Adventureland, Trader Sam, the head salesman of the jungle, will greet you. From coast to coast, these two men share a name and a job (and some jokes), but each coast has their own Sam. 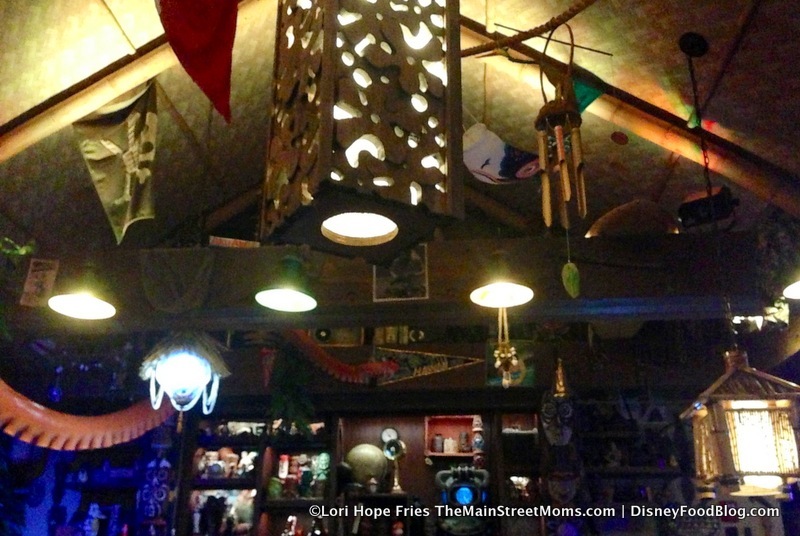 We were excited to see how the tiki bars of the same name differed. We were in the Magic Kingdom when we learned that Trader Sam’s Grog Grotto was holding a soft opening. We hopped on a monorail and headed for the Polynesian Village Resort. The wait time was up to four hours to get in! Luckily, we got a pager from a friend who couldn’t stay, and combined the wait. dumplings and drinks while we waited. 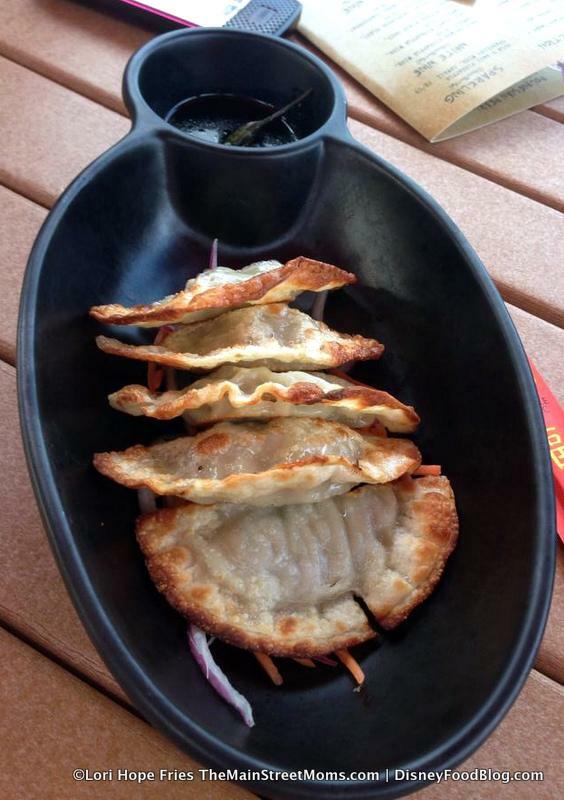 I asked the food manager if the dumplings were the same as the ones at ‘Ohana, and they are not. These Pan-Fried Dumplings with Soy-Sesame Dipping Sauce have pork and shrimp in them. I am allergic to fish and shellfish, but Dennis loved them. They were seared perfectly, with a wonderful combination of ingredients, both sweet and with a little kick. 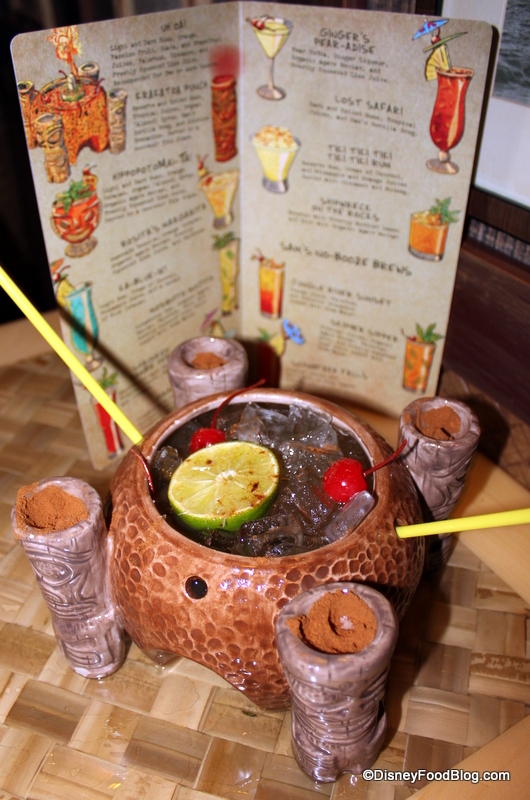 He also ordered the HippopotaMai-Tai, a fruity rum drink served in a tiki glass that resembles the new statue in the lobby. For around $15, he got the delicious drink and was able to keep the glass as a souvenir, too. I got one of Sam’s No-Booze Brews, the Polynesian Punch, served in a plastic souvenir sipper. You cannot order a non-alcoholic substitute if you want a specific souvenir mug; they do not want to confuse serving alcoholic drinks to minors. 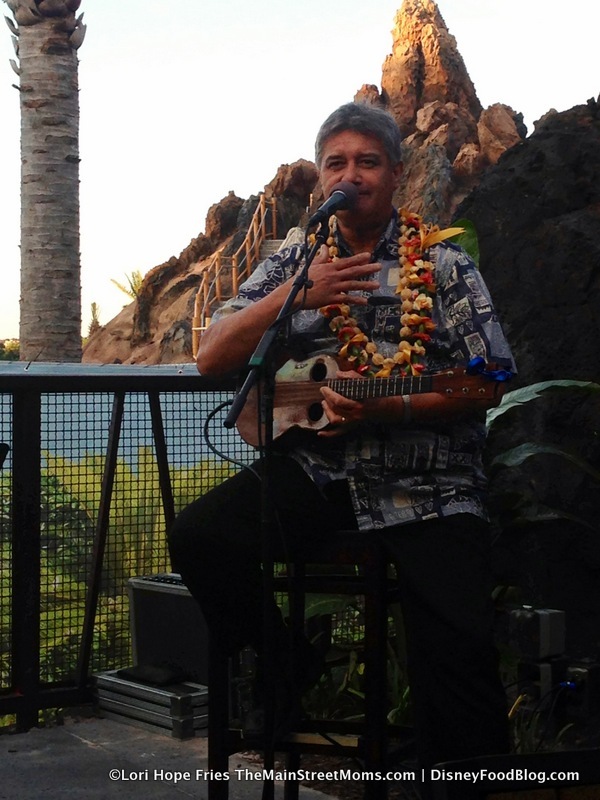 We continued to enjoy live music by an entertainer from the Big Island of Hawaii, before it was time to go into the Grog Grotto. Once inside, the real fun begins. The entire place is interactive. From the chairs to the walls, you know this bar was built for fun. An enormous tentacle curves its way through one side, and the middle bar table is even a surfboard. 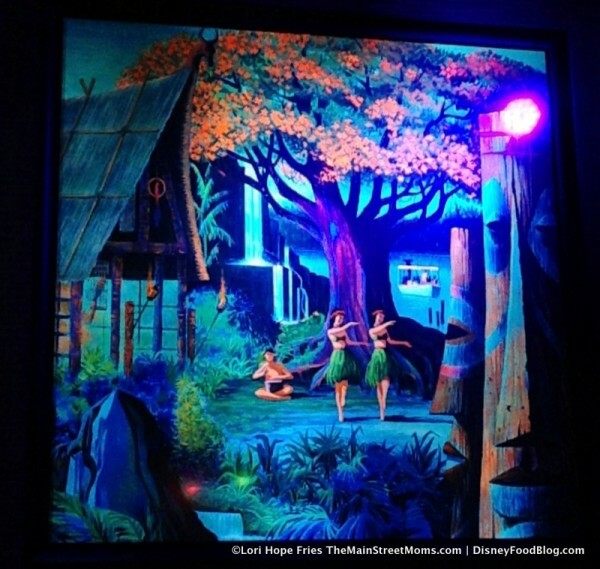 With low-key mood lighting and just the right amount of neon glow, the Imagineers themed the Grog Grotto in good taste. 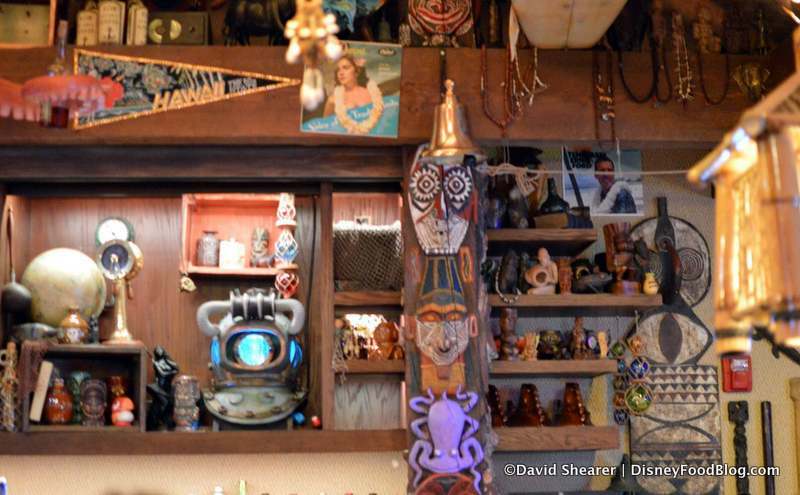 This is not your average tiki bar kitsch. 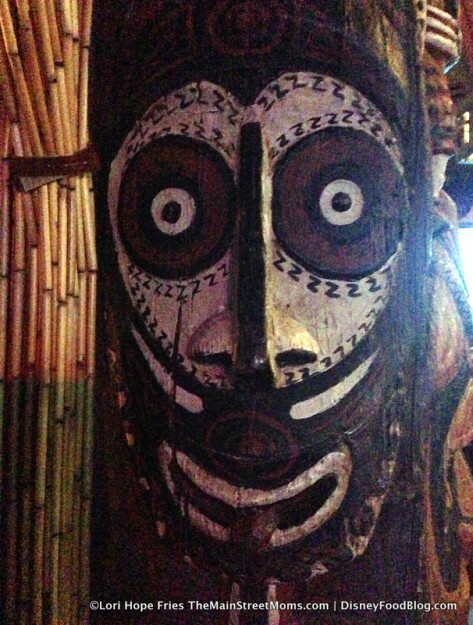 Trader Sam’s Family Tree — East Coast branch! When a special drink is ordered, the lights are cued and elements of the Grotto come to life. Bar patrons join the cast members in celebration of tiki gods and tiki drinks. Disneyland guests will recognize familiar chants, “Uh-oh-ah! Uh-oh-ah! Uh-oh-ah Oh-ah Oh-ah!” Check out this video from Mousesteps.com to see what happens when you order it! The cast members don’t just make the Grotto fun; they ensure your service is of the same high standards across Walt Disney World. I have food allergies so our server called the chef out to discuss my options. He also told me his favorites. We ordered the Chicken Lettuce Cups with Hoisin Ginger Sauce and the Roasted Chicken and Pork Paté Bán Mì Sliders. We liked them both. You assemble the wraps yourself with pickled slaw and diced chicken in a thick sauce. The sliders were good, but I am not sure I would order them again. I don’t love pork paté, and there was too much of the pickled relish for my taste. The people who shared our table had the Headhunter Sushi Roll and Kahlua Pork Tacos with Cabbage and Pickled Vegetables. They said both were delicious, but they didn’t think the taco was filling. Nonetheless, these are appetizers, not main course dishes, and are intended to complement the drinks. 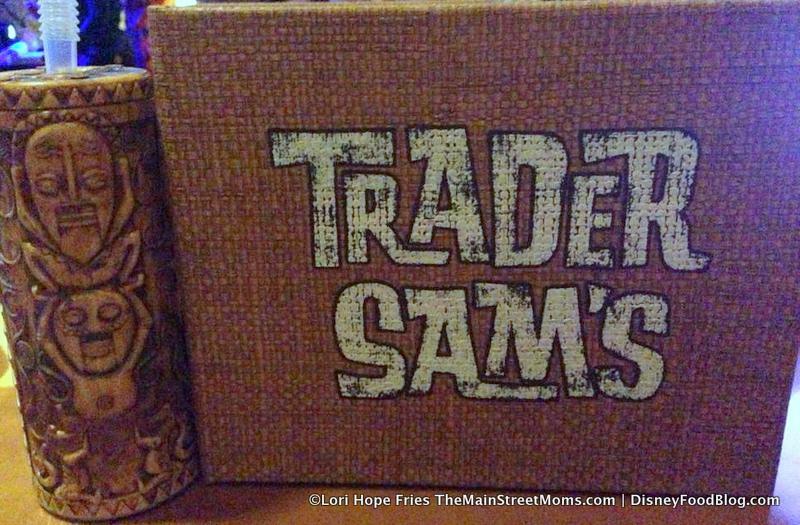 New drinks and souvenirs include: the Polynesian Pearl, a milky and fruity cinnamon rum concoction (a local favorite) served in a pearl ‘Trader Sam’s” cup that’s yours to keep. (Editor’s Note: When the Pearl is ordered, the shell behind the bar lights up and opens as the Bartenders grab the “vessel.” FYI — One out of every 100 comes out black! Check out this video from laughingplace.com to see what happens when you order it! 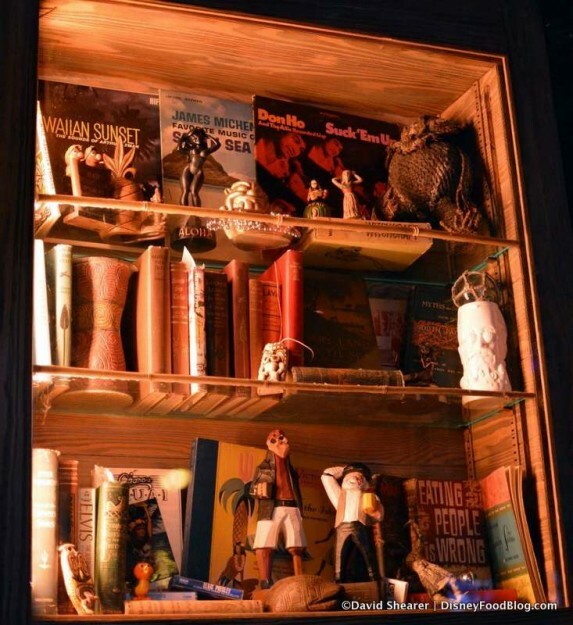 You’ll also find a Rum Flight in three mini tiki mugs; and even a giant ceramic Nautilus submarine filled with tropical juices and rum, big enough to share. They don’t accept Tables in Wonderland or other discounts because it crosses food and merchandising; but prices are reasonable for Walt Disney World. The bar inside only holds 51 guests, so expect long waits to get in while it is still new. I am looking forward to going back many times and collecting all of the different souvenirs. Thanks, Lori!! Sounds like a terrific time at the Grotto! We’d also love to share a few more of the fantastic pictures from David Shearer. He and his wife, Stephanie, enjoyed the Tahitian Torch (ByeJoe Dragon Fruit Spirit, Tropical Juices, Passion Fruit and fresh lime juice) and they also tried the Kalua Pork Tacos. They, too, grabbed a HippopotoMai-Tai! 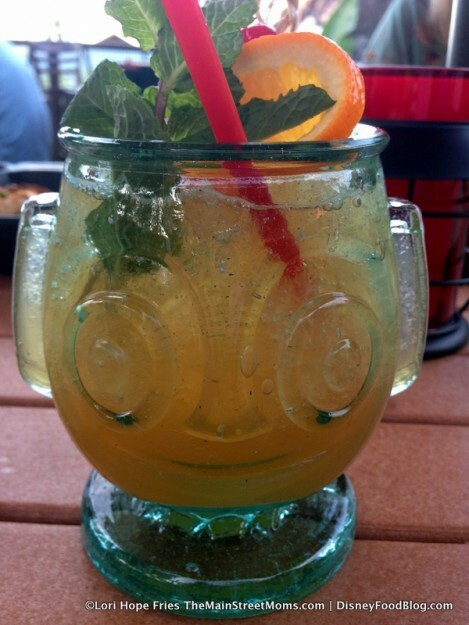 Because who can resist that tiki face? 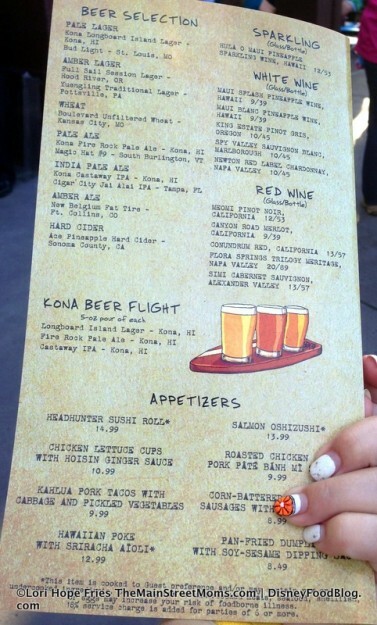 Our Facebook friend Casey N. kindly shared few prices with us (notice they’re not on the menu ;). The Spikey Pineapple (a Dole Whip with rum) is $10.25. The non-alcoholic Polynesian Punch in a souvenir cup is $9.49. The Polynesian Pearl (pictured in white from Lori above) runs around $16. 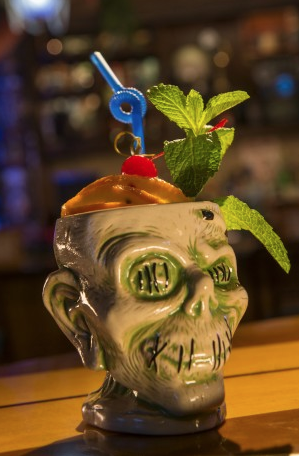 The Shrunken Zombie Head, which comes in its own very special souvenir glass, rings up at just over $20. And, hey, let’s take one more look at that Nautilus while we’re at it! At the time of this writing, it is currently NOT available to take home, but it will be once the official opening takes place in late April. 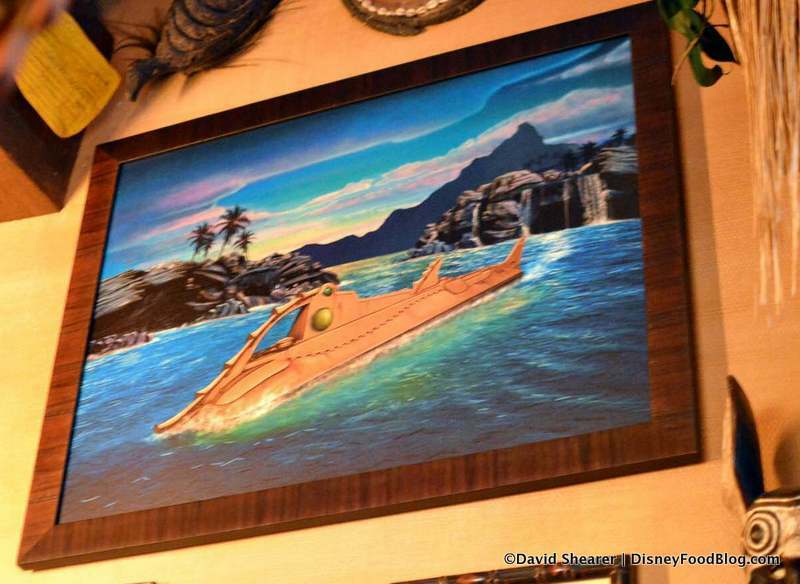 Once it is available, this completely awesome tribute to 20,000 Leagues Under the Sea can be yours for the low, low price of… 52 smackers! (Yep, you read that right!). It’s filled with Barbancourt Pango Rhum, Appleton Estate Reserve Rum, Combier Creme de Peche de Vigne Liqueur, tropical juices, and Falernum, and made to serve two. For the time being, you are able to order the drink and enjoy it in a Nautilus, only without taking it home. And there you have it, folks! The first days at the Grotto are in the books, and just like Trader Sam’s Enchanted Tiki Bar on the west coast, it appears we have another huge hit on our hands! 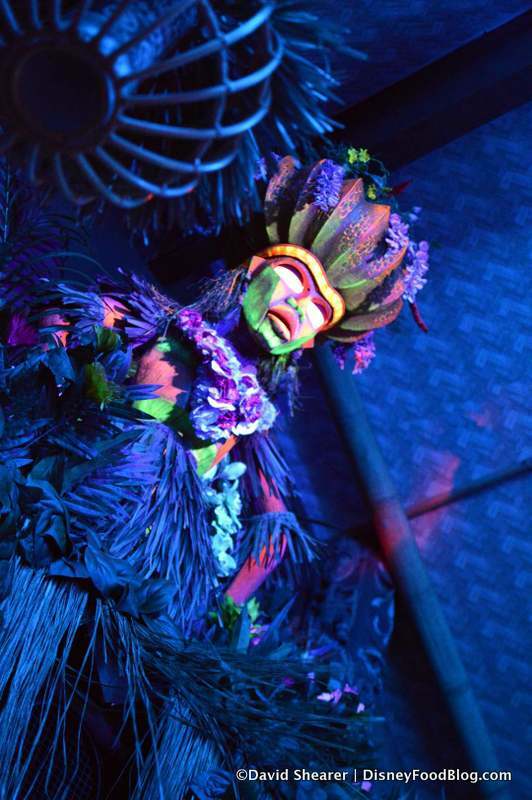 We can’t wait to bring you more fun from Trader Sam’s Grog Grotto in days to come! 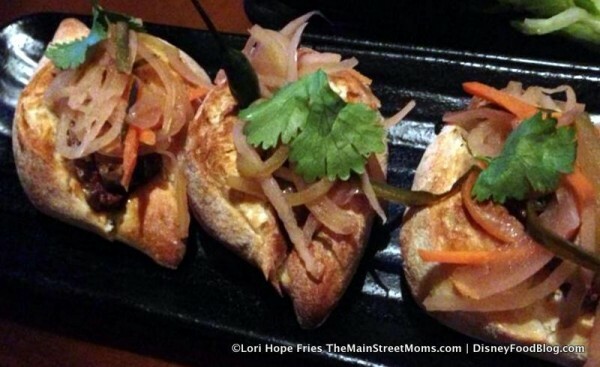 Want more great Disney food news and details, including exclusive deals on DFB stuff? 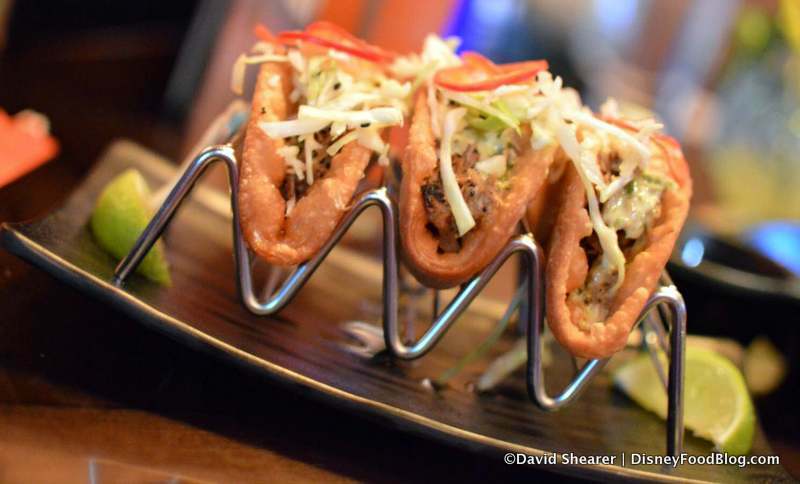 Join us over on the Disney Food Blog Newsletter to be first in the know on all the updates… . What are the “tropical juices” in some of the drinks? I’m allergic to pineapple and most of the drinks that appeal to me have tropical juice listed as one of the ingredients. Hopefully, I’ll get inside in April, provided the lines are short enough. (I’m not waiting hours to get in; I don’t care how cool it is.) I really like what I’ve seen, although that souvenir cup for the non-alcoholic drink can be had at Sunshine Tree Terrace for less money. I have never been to the Polynesian but now I definitely have to go. I love all the souvenir glasses. Were you able to keep the rum flight glasses? How much are those going for? I wanted the Nautilus when I first saw it but $52!!! I don’t want it that bad. Kim, I too have a juice issue. I am on prescription medication. Most people do not know that you cannot consume grapefruit in any form when you take prescription medications. Everything you see that says “tropical juices” can be one of two types of juices. The bartender Cris was very helpful to me yesterday and even spoke with the Chef before serving me. 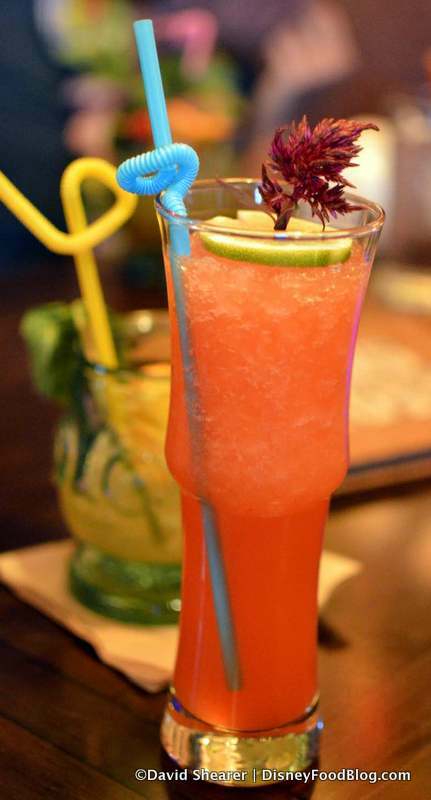 The Chef and bartender said most of their blends are “grogg” juice which is guava, orange, and grapefruit juice. You can ask for the “pog” blend which they said was passion fruit, orange, and guava. Just make sure you discuss your allergies when you arrive. They will help you out! I wonder, if like the Tambo Lounge, you can order the drink without the souvenier mug? Where is the veggie option? Very disappointed that there is nothing on the menu. $52 for that Nautilus. Damn, but do I want it! Wow, I can not wait for the east coast Trader Sam’s to open for good. I may be making an event planned to it. Don’t think Tambu lounge is going anywhere from what I’ve heard. It services all those waiting for Kona Cafe & Ohana, which remain very popular, so I imagine the demand won’t be going anywhere for Tambu! You can order the drinks without purchasing the souvenir mugs. They’re served in those mugs, but if you purchase the mug as well, you get a clean one when you leave! Since the Nautilius souvenir glass isn’t available to purchase right now, is the drink still $52? Or will it cost more once you are able to purchase the glass? 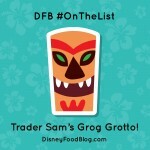 @Nicky – and anybody else who wants a vegetarian option – I spoke with a Disney Special Diets rep and they did confirm that there is NOT a veggie option at Trader Sam’s here in FL yet. They went on to say that if enough interest is shown, they may add one later in time for the “grand opening” (as opposed to the current soft opening). 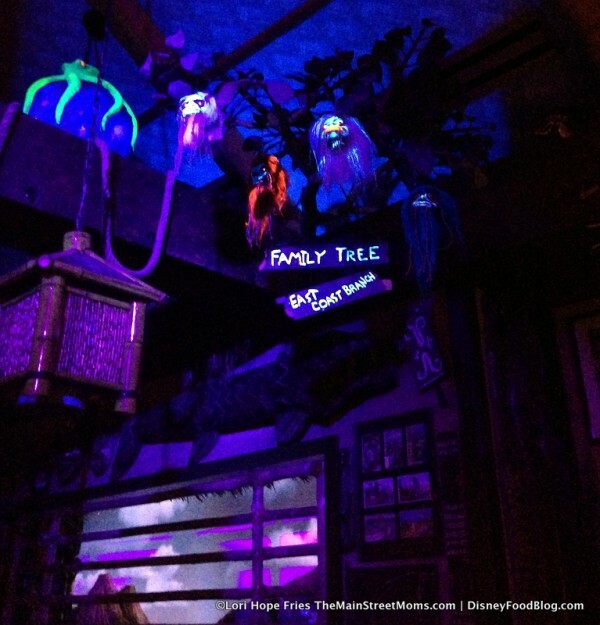 Please – any veggies out there – if you email specialdiets@disneyworld.com and let them know you are missing a meatless option at Trader Sam’s here in Florida – that would help a lot! I think it’s important to have at least one food item (like the deep fried green beans at Traders Sam’s in CA, or the off-menu Coconut Crusted Tofu salad, or the off-menu margherita flatbread they also offer there, but not here in FL,) and it’s usually Disney’s policy to have at least one. 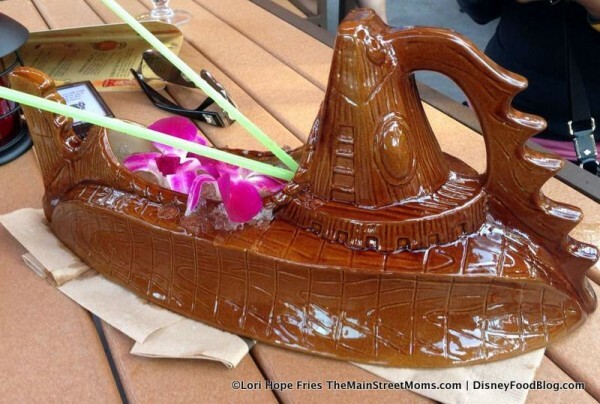 If anything – I know personally I can’t have more than one or two large tropical alcohol-based drinks unless there’s at least a little food in my belly to “soak things up” a bit 😉 Since they’ve removed the Adult Grilled Cheese sandwich at Captain Cook’s too (argh!!) that has ruined my backup plan, hehe. Awesome pics! Krakatoa punch with volcano and uh-oa? I’m in – be there in 2 more months! 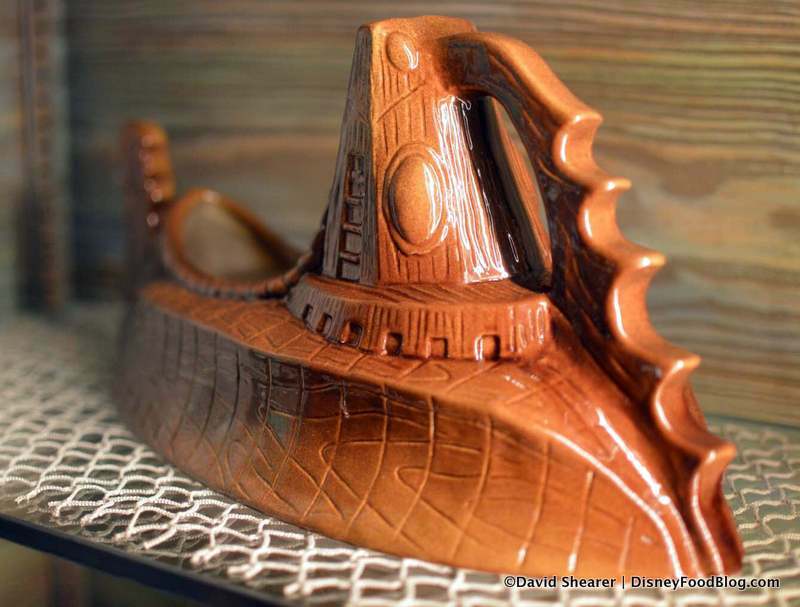 We went expressly for the souvenir Nautilus on day 2. We were not aware that the Nautilus was not available for a souvenir and our waitress did not mention this. If we had been aware we would not have ordered the drink, as it is $29 just for the alcohol and $52 with the souvenir Nautilus. Plan on arriving at least 45 minutes before opening. Gosh, it’s so small. Talk about leaving money on the table. I suppose they think demand will die down but I doubt it. Maybe the step prices will keep people away, however I’m not a drinker and even I would go to pick up some of the souvenirs. I love all the interaction! Oh gosh, there are so many drinks I want to try and so many souvenir mugs/glasses I want to get that my liver has just left my body! Seriously this place looks and sounds amazing and is something we don’t have in the UK. I can see this being very popular for overseas visitors as a must see experience. I have a question though, I find the drink measures “generous” and I can see it being very easy to drink less responsibly, do Disney ask people to leave if they seem drunk? And no I am not asking because that is me I just find it uncomfortable to be in that atmosphere. Also would Disney put a “time limit” on how long you can spend in there to get the crowds moving through? $52?! I wouldn’t spend $52 on my very favorite large bottle of whatever at the liquor store. I’m certainly not spending it on a drink as small as that. How do they deal with the special effects when multiple people are ordering multiple drinks and the sfx compete with each other? Is it about the same size or seating capacity of La Cava Tequila? So, it is tapas inside and out, no meals? 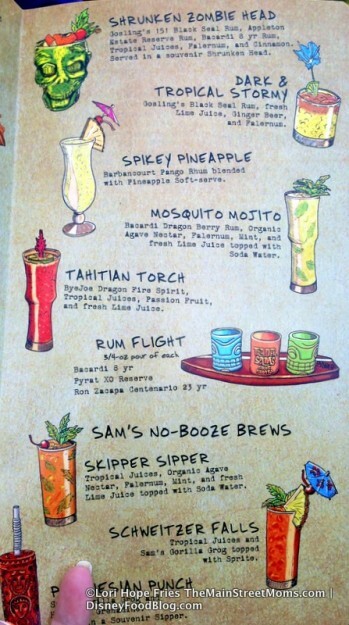 I really have to wonder at the Disney business model for both Trader Sam’s’s (Samses?). 51 seats is easily half of what they could keep full, consistently, year-round for years to come, in my rough/poorly informed estimation. I know from visiting TS’s at D’land that at first it was fairly easy to get in and get a table (that place is tiny, too: recollecting about 30 seats, max), but now it’s nigh impossible to get inside unless you’re there very early in the day. Forget going around lunch time, happy hour time, dinner time, after dinner time. There’s much more seating out on the large, covered lanai, but ~ although that’s pleasant & relaxing ~ all the super cool theming is inside ;)! 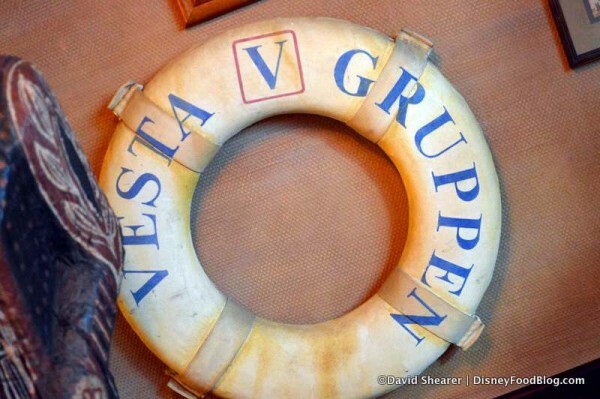 If D’World TS’s Grog Grotto has a 6 HOUR wait just to get to the lanai area ~ during soft opening ~ they may need to adapt a FastPass+ system (or something) for guests to get in more efficiently. I am VERY excited to go have this experience, but not in exchange for 6 HOURS of my precious vacation time. My prediction is that it’ll take years to calm down, if it ever does. D’World attracts so many people EACH DAY, a super-cool 51-seat tiki bar seems likely to be packed ad infinitum. 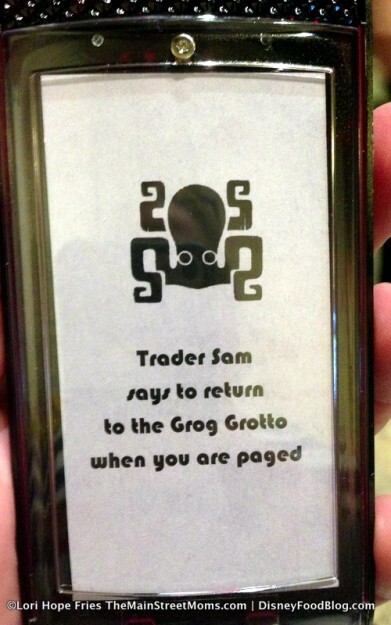 So did they wait in the Tiki Terrace for 4 hours before they got in the Grog Grotto? I had assumed the terrace was a part of the bar, having the same menu and everything. Sounds wonderful, so glad we have this version in WDW, but I don’t think I’ll want to wait that long–I’ll have to save it for a later trip. No place is worth wasting 6 hours of you life, no matter how interactive. This is a for sure visit on our trip in August!! Can’t wait to go there. Looks like so much fun! A lot of people have been wondering why Disney is leaving money on the table by only allowing 51 people in. They certainly could have made this bigger and filled the place. But if you’ve ever been to the Trader Sam’s Enchanted Tiki Bar at Disneyland, half of what makes this place so special is its smaller, more intimate space. It creates the atmosphere of a small, off the beaten path bar that would be truly ruined if it was much bigger. 6 hour waits will dissipate with time. 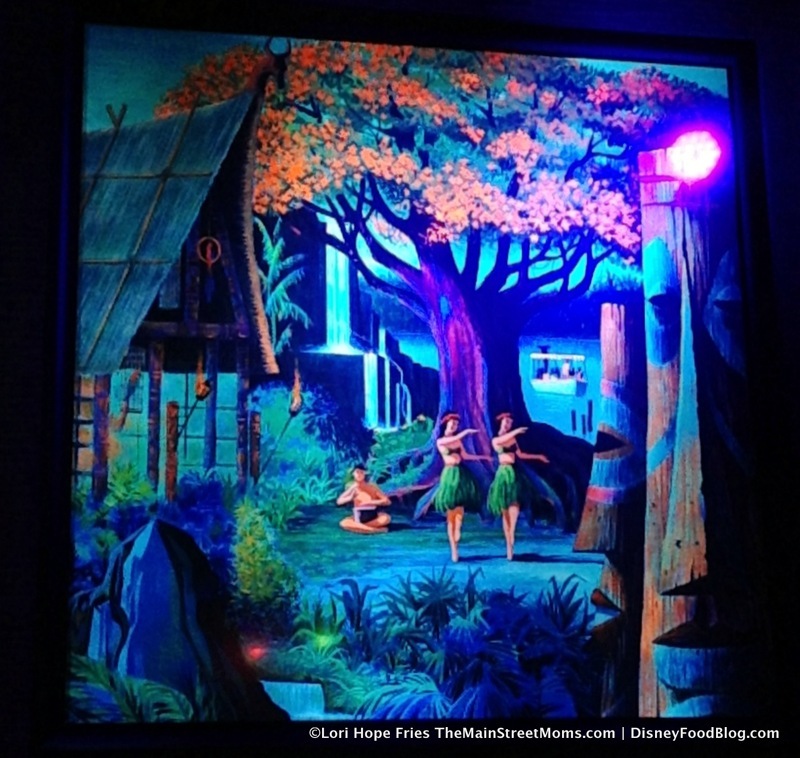 But trust me, once you are inside and get to experience Trader Sam’s, it will all make sense! Having been to the TS’s in Anaheim ~ and having LOVED it ~ I REALLY want to go to the Grog Grotto the next time I’m lucky enough to be in Florida. I was super excited to find out that it was being incorporated into the Polynesian as a part of the big renovation. But I really DON’T want to wait for more than about an hour to do it. Agee totally with AJ. 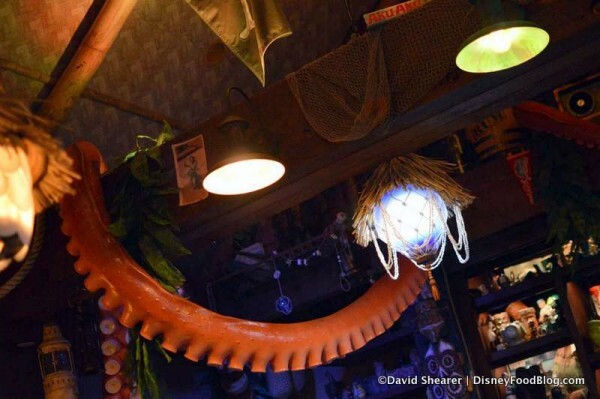 The intimate size is a huge reason Trader Sam’s at DLR is so special. I applaud Disney for not dramatically increasing it’s size at WDW to make more $$$. @ Lori: so… how long did you need to wait to get to the Terrace? Was that once you had the pager (3 hours)? 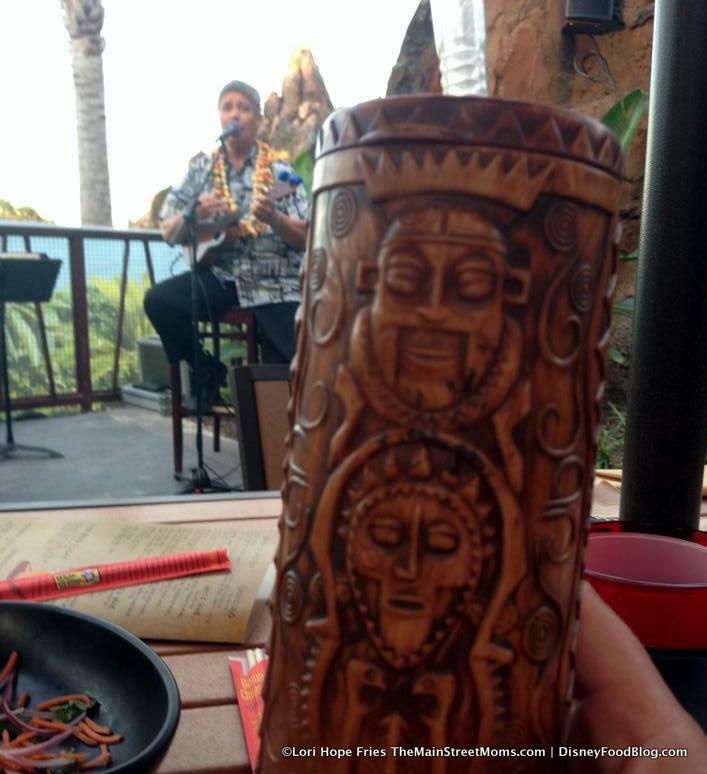 My BF and I went to Trader Sam’s on Sat around 10. They stopped allowing people inside by then (now I know it’s because all the pagers had already been given away). We went out to the terrace instead where there were several open seats. You can walk up to the bar and order or there were servers coming around as well. I wanted to get the pearl because I’ve recently developed a love of rumchata but it’s the only drink you can’t get without the souvenir cup. I had the castaway crush instead which was quite nice. We watched wishes and the music is piped in but the umbrellas were in the way of having a great view. I’m looking forward to another visit when we can hopefully make it inside. seating capacity is 47 at Disneyland and 51 at WDW. They chose not to change the size of the bar much from coast to coast. I guess you’d have to find the head imagineer on the project and ask him why. 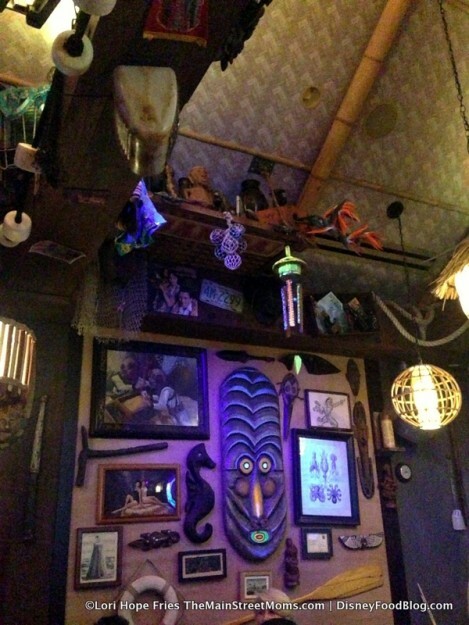 Trader Sam’s is a lounge, not a restaurant. Doesn’t serve full meals or accept the dining plan. No discounts accepted, including Tables in Wonderland. Casey Neidemeier Clark I’m on meds and asked my doc about the grapefruit thing. She says that something occasional is ok. Just not all the time. If you compare prices to the Tiki bowls from Tiki Farm and other companies, or even things like the Enchanted Tiki Room 50th anniversary mugs and bowls, the Nautilus is actually right in the same ballpark (relative to some, the alcohol is practically free). I guess it depends on how much you’re into Tiki mugs. I am a bit of a Tiki geek, but I’m even more of a Jules Verne, 20,000 Leagues nerd… I don’t know when I’ll get a chance to see this, but I do have an emissary going in May who can hopefully get the bowl for me. 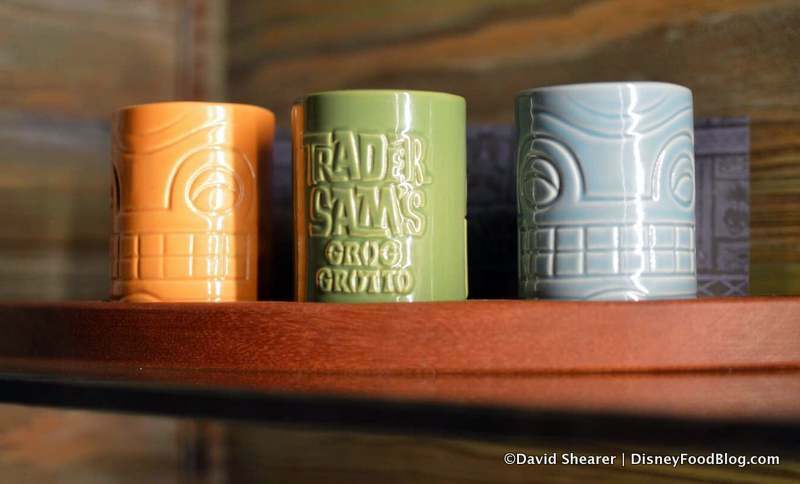 Any idea if those rum shot glasses for the rum flight are souvenir cups you can take home? Any idea if this restaurant will be added to the dining plan options? Also when will ADR become available? I’m going in October but I know the reservations will fill up fast! Thanks! 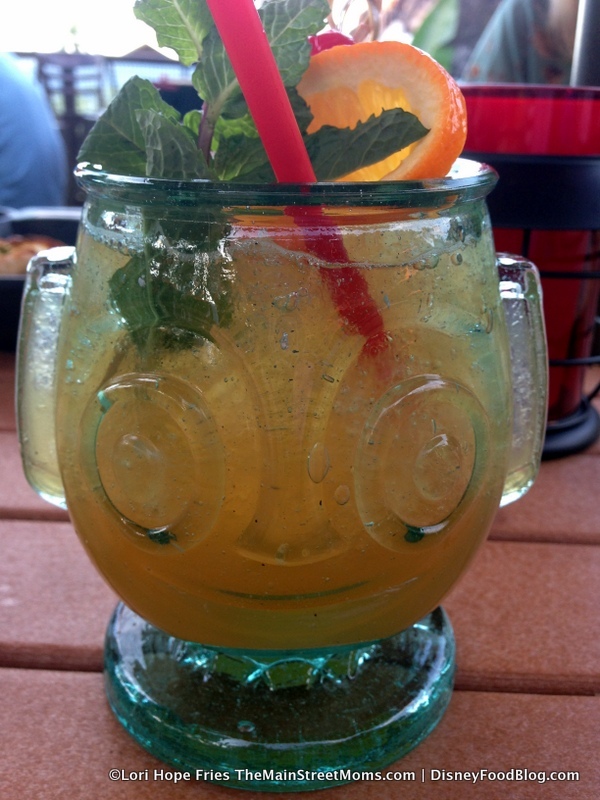 When you order a drink at the outside bar, do you still get to keep the mug? And also, how do you get your mug on the way out? Do they give you a ticket or is there some other form of redemption? 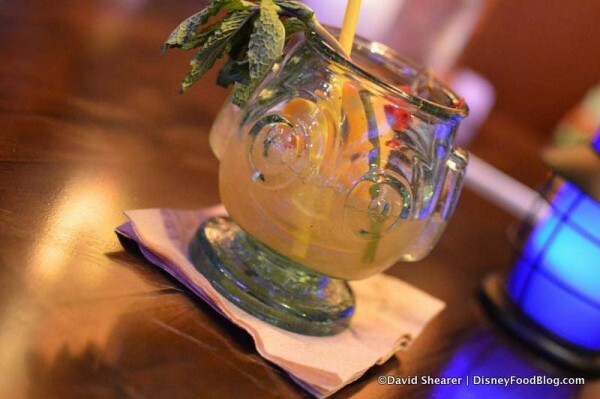 We love Trader Sam’s at DL, and we’re looking forward to the new outpost in WDW. It’s not the Adventurer’s Club (RIP), but it’s pretty dang fun. 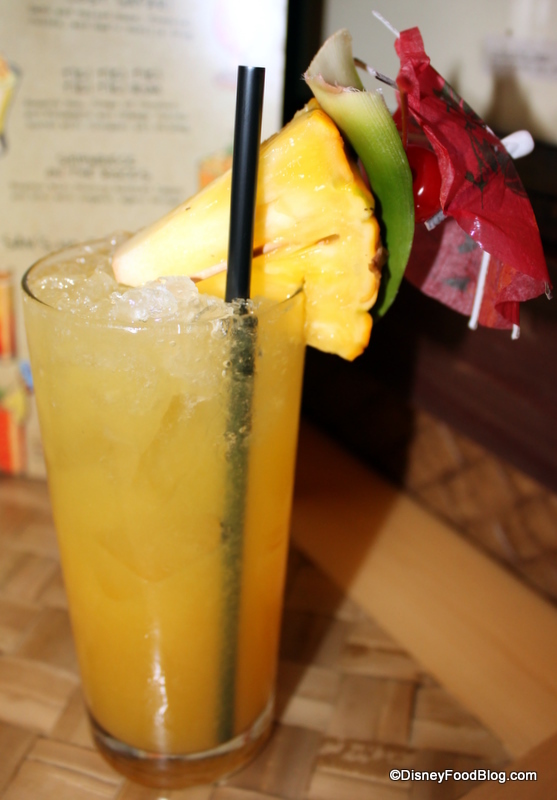 And the Hippopoto-Mai Tai is a great drink! This looks so fun!! 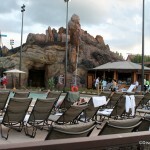 My husband and I went to the Polynesian for the first time last November and saw all the new things being built. The new bungalows look nice, but they seemed to have taken away the view from the beach, so that’s a bummer! But looks like a nice view from the new terrace. Look forward to checking this spot out, especially all the new interactive things! As far as acquiring the souvenir mugs/glasses/containers at Trader Sam’s in DLR go, they’re pictured on the menu with their respective drinks. If I remember correctly, the drinks aren’t mix-n-match with the mugs: drink “A” goes with container “A” so you can’t get drink “B” in container “A,” etc. Once you choose your drink/mug option it comes to you at your table as such. Yum! However, if you’ve paid for the mug/goblet/glass/etc., that will come to you wrapped in bubble wrap, in a cardboard box, clean and right off the shelf. You don’t keep the one you drink out of. 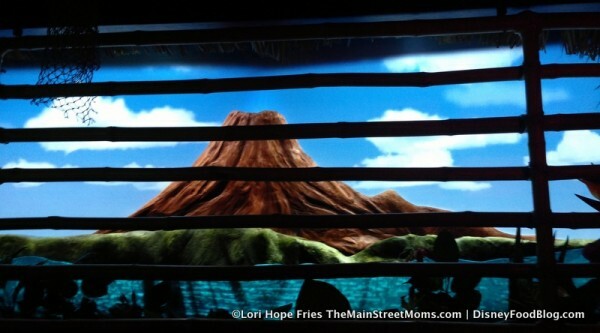 PS: the clear glass you get with the Hippopoto-mai tai that’s pictured above is slightly different from the one I got at DLR. Just had the worst experience at Trader Sam’s outside bar. They had an extremely rude server named James who messed up our entire drink order. It took us more than 1/2 hour to get served and the drinks were over priced. They charge an automatic 18% gratuity so they don’t care if they have poor service. The service inside was much better but the food and drinks are still over priced. I would strongly recommend going to off property bars and restaurants much better food and service at a reasonable price. Just got back from a wonderful trip to DLR/DCA! Our first stop was Trader Sam’s for apps & drinks. We got there about 4:00 on Thurs 4/30 & wanted to sit inside but the place was already filled to the gills. Sat outside on the lanai but had to have our table moved about a half hour later to accommodate the two Hawai’ian guys who set up to play music. In fact, for some unknown reason, there isn’t shade for the lanai, except adjacent to the wall: it’s covered by a palm thatched overhang. Mysterious to me why the rest of the tables/couches aren’t covered under umbrellas (or something) during the afternoon. It happened to be about 90F that afternoon, so shade would’ve really helped! 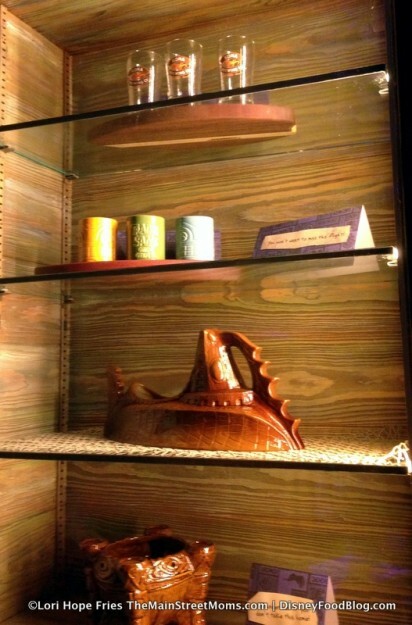 I noted that the ceramic mug for the “Uh Oa!” & “Krakatoa Punch” had changed. The new KP glass is still a brown tiki mug, but it now has red lava flowing out of the top. Pretty cool looking! We got both the new and old versions of the off-the-menu drink “Kungaloosh,” both of which I thought were delicious! Apparently, there’s a (as in ONE) bartender there ~ Christian, Chris, Christopher: can’t remember ~ who can make a grown-up Dole Whip w/ rum which I REALLY wanted to try, but he wasn’t there that day 🙁 . Additionally, there are a bunch of other off-the-menu drinks you can get if you know to ask for them. I found a list on defectivegeeks.com . Our server (can’t remember her name) was great & I observed her being very patient with a difficult customer. Didn’t notice till this time that there’s a portion of the bar that is lower in height than the rest of it: it looks designed for accessibility for folks in wheel chairs or smaller people. I’m 5’2″, so it looked pretty appealing to me ;)! It was dark, but I think maybe 3 or 4 people could sit there. I’ll keep going back, but I SURE wish it was bigger inside: I think for every 3 times I go there I actually get to sit inside once. I agree with another person on here. Where are the veggie options? Everything either has chicken or pork in in and some people try to avoid meat. I’m a pescetarian but don’t want my fish raw. 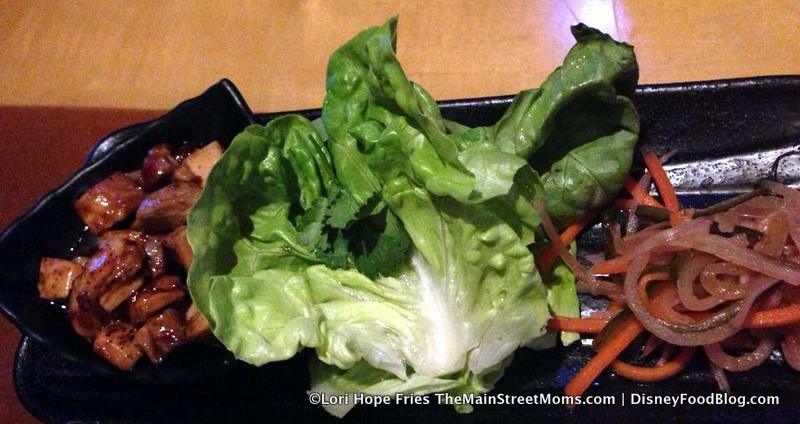 Either a shrimp taco or a veggie lettuce cups would have been nice. Kind of disappointed in the menu. Not sure it’s worth the long wait. What a great place to go on a Holiday afternoon! After a quick “3-FastPass selection” day at Magic Kingdom (only way to go; get in, eat lunch, 3 attractions, get out before the parade starts! 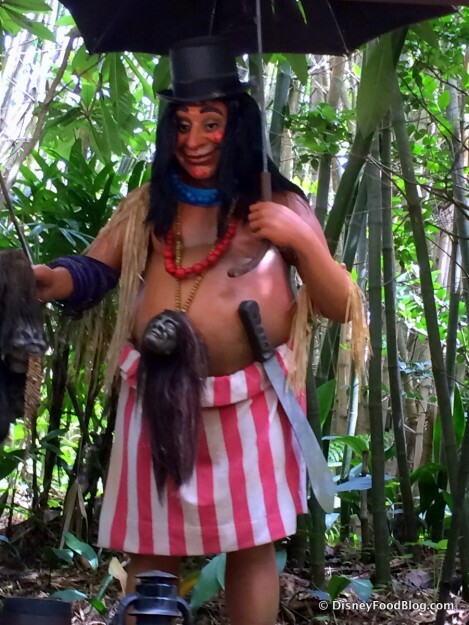 ), hopped on the Monorail, and I took my mom to Trader Sam’s Grog Grotto. On Memorial Day! We got there at 3:25 pm, got on the waiting list (we were nos. 25 & 26 of 50), and, of course, it opened at 4 pm on the dot. We were only two people, so we got one of very few dedicated “two-top” tables and it’s a really fun experience. The appetizers are tasty (pork tacos and sliders), and we got four of the drinks in the souvenir glasses (I know, I know, it’s so worth it, though). These are NOT watered down drinks. Loaded with really good rum! As mentioned by many, lots of cool stuff happens when you order the specialty drinks. The two best drinks, in terms of drink caliber and quality of the souvenir mug, in my opinion, are the Krakatoa Punch and Shrunken Head Zombie (The latter has falernum in it, for crying out loud! Look it up!) — both delicious and refreshing! The whole bill, with a 20% tip (they deserve it; those servers work very hard) was a little north of a hundred bucks. Life is short! Live it up! Enjoy yourself! And guys… You are not going to remember how much you spent, 20 years from now… You will remember the great day you had with your 88-year-old mom! Are the HippopotoMai-Tai glasses available for sale anywhere else? 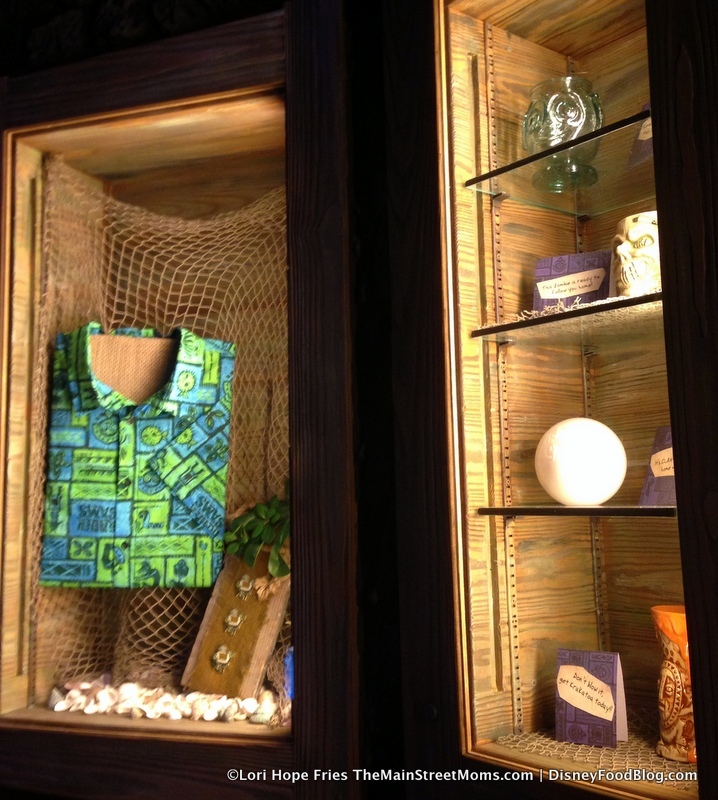 I thought i saw somewhere that they popped up from time to time in the Polynesian gift shop. If i could pick up those elsewhere, it would cut down on the beverages i will have to consume in September! Hi, Josh. I was just there for July 4th weekend and I didn’t see Hippopotamai-tai in the ground floor gift shop, but I did see some clear glass, bowl-type Mai-Tai glasses — a more traditional Polynesian tiki design; less “characterized” Hippo face — and they were $15.00 bucks. For a few bucks more, I’d rather have the drink AND the glass. Have fun in September! Even the Be our Guest restaurant kind of looks like a cafeteria to pack more and more folks in. 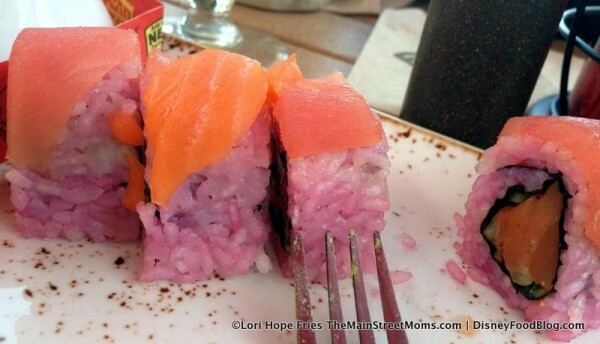 There are so few restaurants at WDW now that are truly fun. I can see why this place is so popular.